In some areas, bears have been reported to intensively mark trees using their claws and teeth. The exact significance of this behaviour is still debated in the scientific community, since tree-marking is not commonly observed in every bear population. 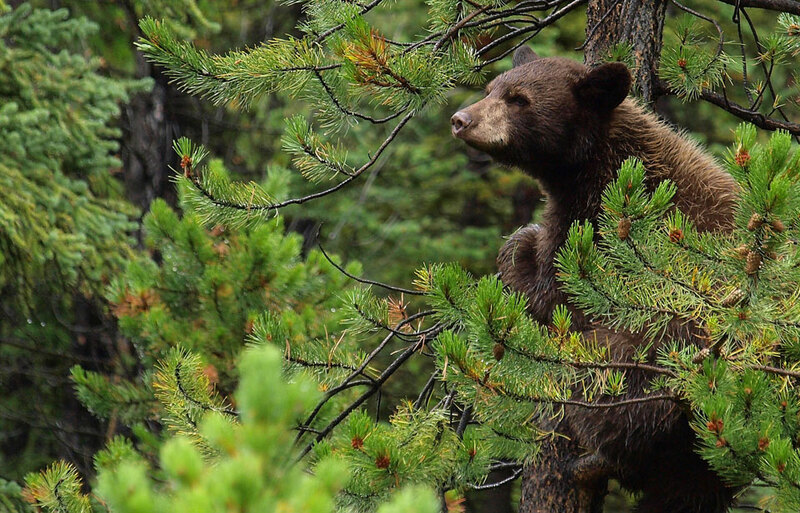 Some biologists nevertheless think that trees repeatedly clawed and marked by bears serve as a form of communication. Adult males use these trees most frequently, presumably to advertise their presence to potential mates or potential rivals. Most markings are done during the breeding season in late spring or early summer. Although rarely heard, the black bear has several distinct calls. These include growls, whining, jaw snapping, and loud snorts of many kinds. 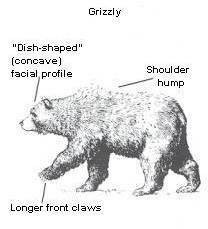 These sounds are usually emitted when the bear is afraid or threatened. 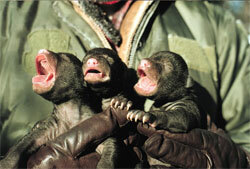 A female with cubs may warn them of danger with a loud woof-woof and call them in with a whining or whimpering sound. The cry of a young cub in trouble is similar to the crying of a human baby. Although found in a variety of habitats, the black bear prefers heavily wooded areas and dense bushland. Maximum numbers probably occur in areas of mixed coniferous–deciduous forests, where human presence is low. Bear population density estimates range from less than 1 bear per 10 km2 to 10 bears per 10 km², but these values are rare extremes. Density usually averages two bears per 10 km² in most remote areas. 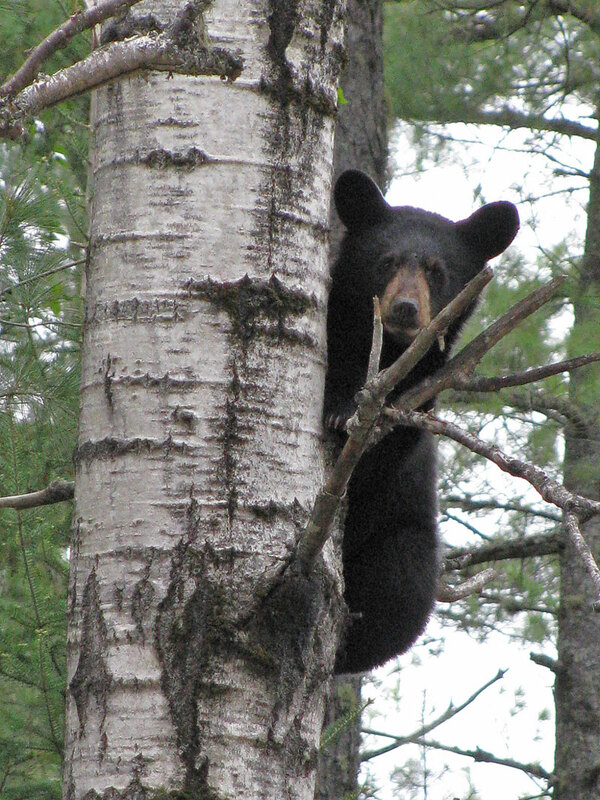 Black bears are difficult to count, because they are shy and secretive. No reliable estimates of the total black bear population exist in North America, but it probably numbers around 600 000 animals. More than 380 000 black bears live in Canada. Black bears are capable of travelling great distances. Biologists who have live-trapped bears and moved them more than 200 km from their home ranges have sometimes been surprised by the bears’ return. The home ranges of females are usually quite restricted and typically average 10–40 km². Ranges of adult males encompass several female ranges and are often more than 100 km². Like most animals, they have customary routes of travel, which they regularly follow as they move from one area to another. Old-time bear hunters took advantage of this and frequently set their traps along these well-used trails. 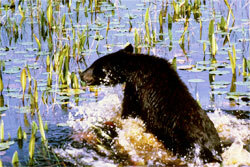 The activity pattern of black bears varies from area to area depending on a number of factors, including human activities. In wilderness areas they are usually most active from dawn until dark, whereas bears in areas with high human activity may be mainly nocturnal to avoid contact with people. In the autumn, when days become shorter and temperatures cooler, bears begin to search for a denning site. A suitable site may be under a tree stump or overturned log, or in a hole in a hillside. Most dens are only large enough to accommodate a bear when it is curled up. Generally, females line their dens with grass, ferns, or leaves; males usually do not. Females usually den earlier; males frequently wait until the first snowfall before entering a den. Juvenile (one-year-old) bears den with their mother. Imagine how crowded a den could be when packed with a mother and three or four yearlings! Studies of black bear physiology have demonstrated that denned bears show some characteristics of true hibernators. Although body temperatures are only slightly lower than when the bears are active, heart and breathing rates are greatly reduced. In addition, unlike many small mammal hibernators, bears do not have to eat or eliminate waste, but subsist entirely on their stored fat. However, black bears are not true hibernators, and most bears can be roused if prodded sufficiently. If the weather becomes exceptionally warm, some bears may wake up and wander around for short periods during the winter months. 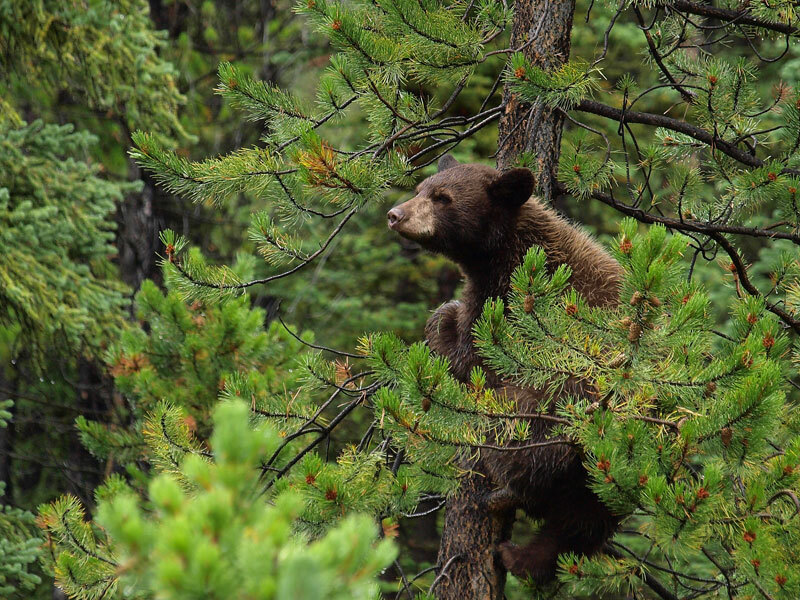 With the coming of spring and warmer weather, bears emerge from their dens and search for food when tree leaves and leafy plants are greening. During the winter they may have lost up to 30 percent of their pre-denning weight. Most bears continue to lose weight during the early summer period until mid-July when quantities of berries start to become available. Bears really gain weight, however, when they can forage for mast, foods such as beechnuts and acorns, during fall. Some bears will double their weight in less than two months when they have access to large amounts of food of this type. Black bears are attracted by garbage and sometimes congregate at dumps. They will also occasionally approach homes and campgrounds when food and garbage are not stored properly out of their reach. Most bears are extremely shy and retiring and usually avoid direct contact with humans. They rarely move away from tree cover. 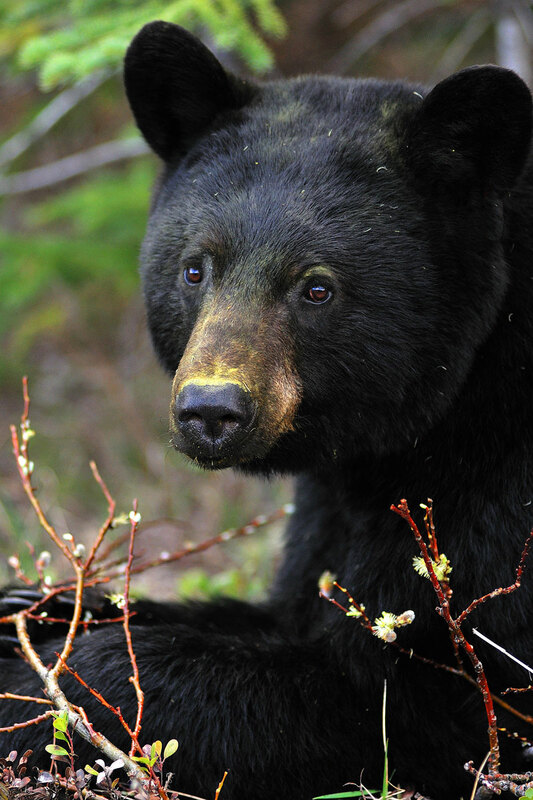 Incidents of black bears attacking humans have been reported, but are extremely rare. If you are afraid to go in the woods where bears are living, just consider that in the past century, for each human killed by a black bear in North America, approximately 17 were killed by spiders, 25 by snakes, 65 by dogs, 180 by bees, and 350 by lightning. Just the same, when people watch bears in the wild they should never forget that these are wild animals that must be treated with caution. Do not try to approach or feed a bear that does not seem to be afraid of you. Bears are interesting to observe and photograph, but they can react suddenly to your presence at close quarters. Occasionally bears cause trouble when they prey on livestock or upset beehives in an apiary, or bee farm. Usually incidents of this type are caused by one or two bears, and the problem is solved by adopting better farming practices, such as moving the apiary or livestock away from the forest, and by installing electric fencing around the beehives and pastures. 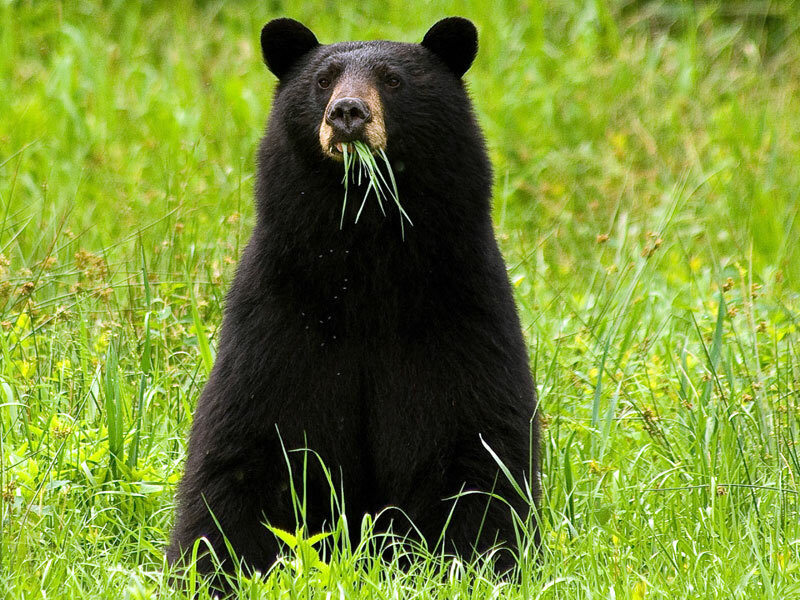 The lips of the black bear, unlike those of other animals, are free from the gums, and the bear can use them and a long, agile tongue to eat such foods as tiny blueberries and ants. The eyesight of the black bear is relatively poor, but its senses of hearing and smell are well developed. A startled animal will usually attempt to get downwind from an intruder and stand up on its hind legs to smell and try to identify the source of danger. Under favourable atmospheric conditions and at considerable distances, bears can detect carrion, or the flesh of dead animals, which they scavenge. Black bears appear awkward as they shuffle along, but can move with amazing speed when necessary. For short distances they have been clocked at speeds of up to 55 km/hour. 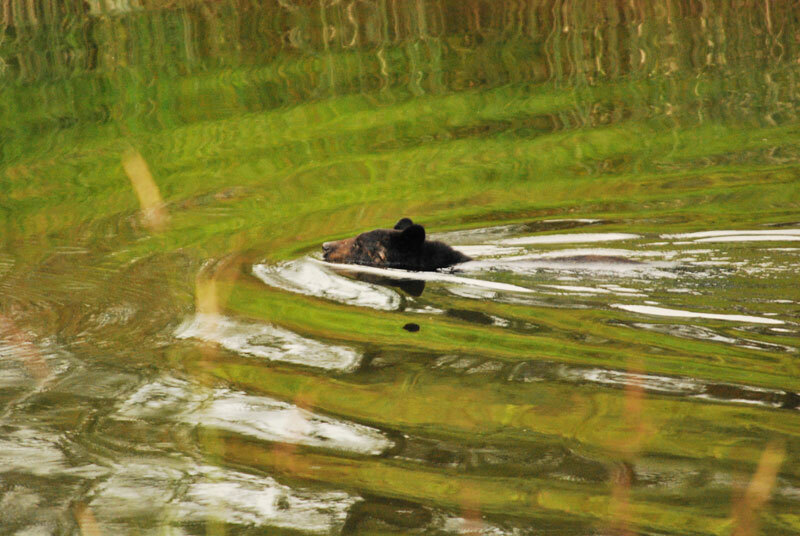 They are good swimmers and frequently cross rivers and small lakes. Climbing is second nature to a black bear. Young animals readily take to trees when frightened. They climb with a series of quick bounds, grasping the tree with their forepaws and pushing with their hind legs. When descending they travel backwards, frequently dropping from the tree from heights up to 4.5 m. Once on the ground, they quickly disappear into the underbrush, apparently unshaken by the abrupt descent. 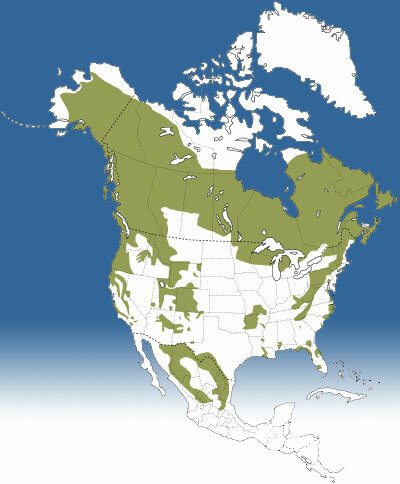 Originally, the black bear was widely distributed in North America, from the east to the west coast, as far north as Alaska and as far south as Mexico. Now, the species occupies approximately 60 percent of its historical continental range. In Canada, the species has been extirpated from the most southern parts of the country. It is not found on Prince Edward Island, on Anticosti Island, in southern Ontario, in southern Saskatchewan, or in southern Alberta. Black bears will eat almost anything available. Most of their food is plant material, especially in the late summer and autumn when berries and nuts are available. Favourite fruits include blueberries, buffalo berries, strawberries, elderberries, Saskatoon berries, black cherries, and apples. Acorns, hazelnuts, and beechnuts are other preferred foods. Insects such as ants rate high, and black bears will overturn logs, old stumps, and stones while hunting for food. 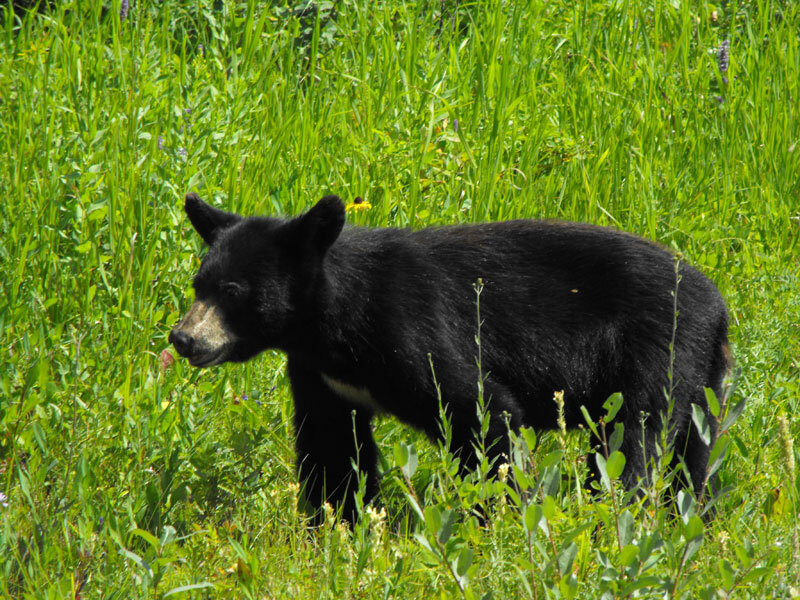 Fish, small mammals, and birds are sometimes on the black bear’s menu. In the spring some bears may prey upon newborn moose calves, deer fawns, caribou calves, or elk calves. Bears are also attracted by carrion, or dead animal flesh. People often think that bears are honey-lovers (perhaps because of the story of Winnie-the-Pooh). In fact, bears are much more interested in insects, and they are probably more attracted by the larvae than by the honey they find in the hives. 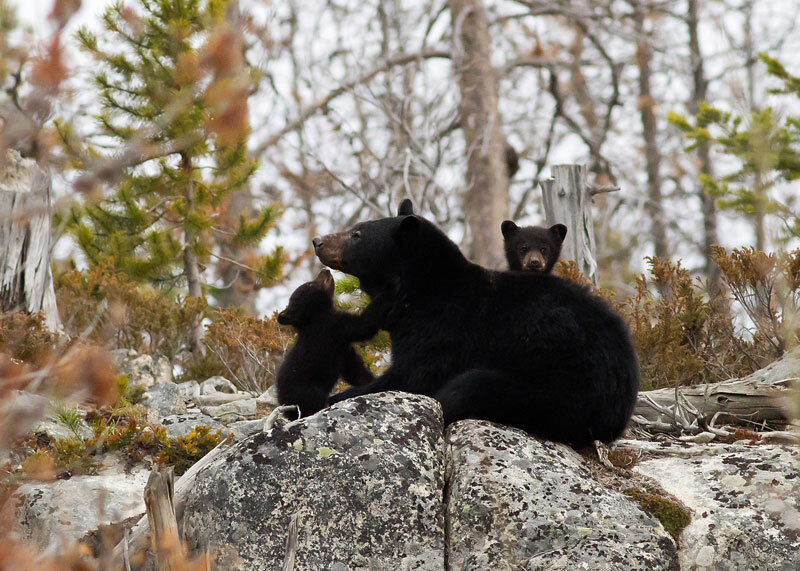 Black bears are solitary animals, except for the close bond between females and cubs and the pairing that takes place during the mating season. Mating is in June or early July, and the cubs are born the following January or February while the mother is still in her winter den. This may seem like a very long gestation period, but in fact the embryos stop growing a few days after fertilization and do not implant in the uterus until the beginning of the denning period in early November. This pause in embryo development, called "delayed implantation," is common to all bear species and is observed in some other mammals, notably the members of the weasel family. In late summer and fall, the female black bear eats as much food as she can find in her habitat in order to gain as much weight as possible. If she weighs at least 70 kg when she enters her den, there is good chance that the embryos will implant and gestation will continue. Generally, two cubs are born, although there may be only one or as many as four or five. Only a female in very good condition, however, will give birth to more than three cubs. The amount of food in the habitat is therefore critical in determining the probability of giving birth and the number of young in the litter. At birth cubs are 15 to 20 cm long and weigh slightly more than 225 g (0.225 kg). Compared to other mammals, this is very small relative to the mother’s weight of 70 kg. For example, a woman weighing 70 kg could expect her infant to weigh about 3 kg, 12 times the mass of a newborn bear! The young bears grow rapidly and are quite active by the time they leave the den with their mother in the spring. At one year they weigh from 13 to 27 kg, but only slightly more at two years. Normally, cubs have an 80 percent chance of surviving to independence, but cubs orphaned during their first summer have only about a 30 percent chance. Because young bears normally remain with their mother until they are 16 to 17 months old, female bears usually mate only every second year. Nursing and raising cubs require a lot of energy from the mother, and females in poor condition may not mate. Males and females may attain sexual maturity between their second and fourth years in captivity, but often later in the wild, where the age of first breeding varies between their third and fifth years and also depends on the condition of the female. Male bears continue to grow until their seventh year; females stop growing somewhat earlier. Bears have lived for 25 or 30 years, but most animals in the wild would be less than 10 years old. 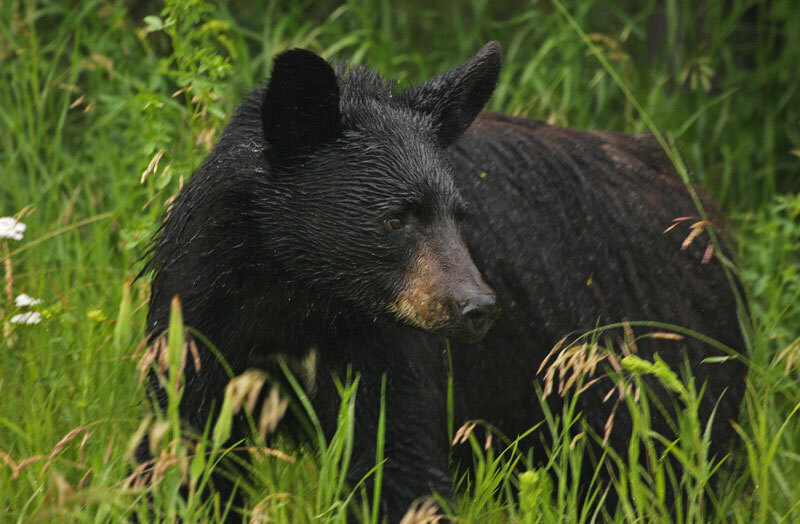 In areas where it is permitted, legal hunting is one of the major causes of death for black bears, especially for bears two years of age and older. Males are usually shot more often than females because they are less cautious and travel more widely. Females become more vulnerable with increased hunting pressure. Young bears in both hunted and unhunted populations sometimes die from accidents and predation by wolves and grizzly bears. 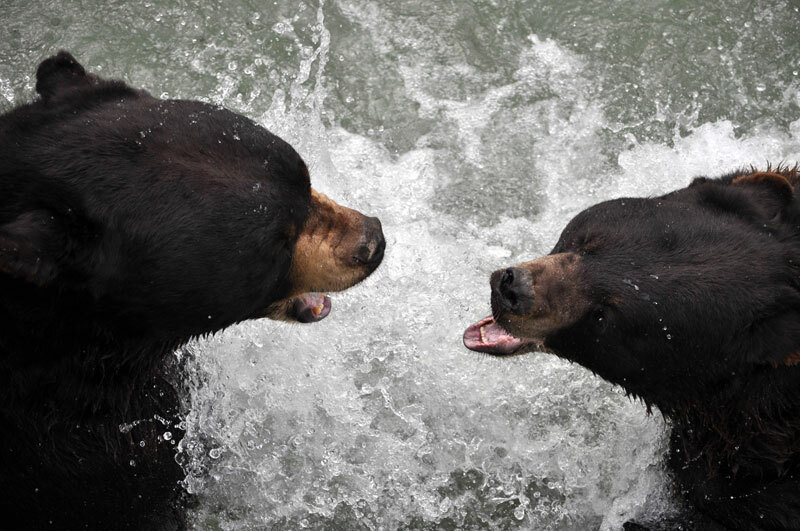 Cannibalism of cubs and young bears by large male black bears has been reported. The attitude of people toward bears has always been one of caution, respect, and even reverence. Many Aboriginal people have special veneration for the bear, and any hunter who kills a bear commands considerable respect. In the early days of European settlement, bear hunters made their living hunting and trapping bears, wolves, and cougars because of their presumed danger to livestock and perhaps people. In fact, most black bears kill few large mammals and cannot be classified as predators in the same manner as wolves, weasels, or polar bears. They are now prized as game animals because they are large and elusive and test the skills of hunters, and also because bear meat, if properly prepared, is considered tasty by many people who enjoy eating wild game. Bears are often killed illegally, however, because people simply do not tolerate them near their livestock, cultivated fields, houses, cabins, or campgrounds. Hunting is not considered a threat to bear populations because it is regulated. About 40 000 black bears are harvested by hunters each year in North America, and about half of them are hunted in Canada. The number of hunting seasons (fall, spring, or both), their duration, and the bag limits vary among provinces and states. Recently many jurisdictions in Canada and the United States chose to close the spring hunting season in order to maintain a healthy number of bears and to lower the risk of orphaning young cubs. Bears are sometimes affected by parasites and diseases, but rarely die from them. From a public health viewpoint, trichinosis, which is caused by a nematode or roundworm, is probably the most important parasite of bears. Because people can become infected, all bear meat should be cooked carefully before consumption. In the past, bear gall bladders, bear paws, and other parts were in demand in some parts of the world because they were believed to have medicinal value. This caused concern about the illegal killing of bears. To combat this practice, the black bear has been protected since 1992 under the Convention on International Trade in Endangered Species (CITES). A hunter wishing to transport any part of a black bear through customs of any country that is a member of CITES must obtain a CITES export permit from the exporting country. Apart from the intolerance of humans towards bears, the greatest threat to the maintenance of bears in areas where humans are living is the fragmentation of their habitat through the clearing of the forests for agriculture and urban settlement. Logging, if properly practised, however, will not negatively affect bears. It can even enhance the quality of the habitat if the mixture of mature forests and young regenerating stands is maintained. Mature trees provide cover and mast (in areas where hardwoods are present), and new growth provides food. Thanks to the healthy status of the its population in Canada, the black bear is not considered a species at risk in Canada. Larivière, S. 2001. Ursus americanus. Mammalian species no. 647. The American Society of Mammalogists. Pelton, M. 2003. Black bear —Ursus americanus. In Wild mammals of North America:. Biology, management and conservation. G.A. Feldhamer, B.C. Thompson, and J.A. Chapman, editors. 2nd edition. Johns Hopkins University Press, Baltimore, Maryland. Rogers, L. 1999. American black bear. In The Smithsonian book of North American mammals. D.E.Wilson and S. Ruff, editors. Smithsonian Institution Press, Washington, D.C.
© Her Majesty the Queen in Right of Canada, represented by the Minister of Environment, 1968, 1970, 1973, 1984, 1988, 1993, 2008. All rights reserved.